Pedroia started at second base and played two innings Saturday against the Mets, Jason Mastrodonato of the Boston Herald reports. The Red Sox said Pedroia would increase his workload in his second start, but he played the same number of innings as he did in his first spring start. He made a couple of routine plays in the field and ran hard on a groundball out. 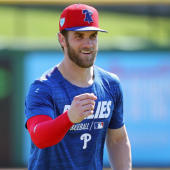 He'll get off-days Sunday and Monday before returning to the diamond Tuesday, when the team plans to ramp up his workload.